British indie author Mike Madden has written several books in several different genres and finds success and challenges in each one. He details his success with Amazon’s KDP Select and discusses the other ways he’s marketed his work. 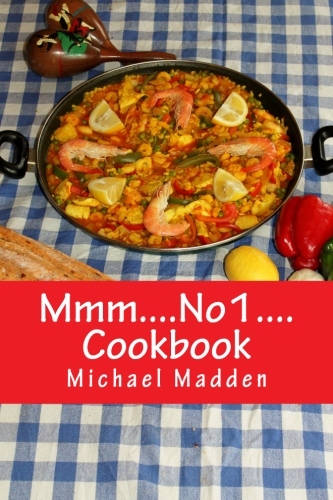 Mmm…No1…Cookbook was originally conceived so that I could keep all of my recipes in one place. I am an avid cook (not chef! ), and have around 40 cookbooks, as well as newspaper and magazine cutouts and handwritten recipes handed down from my mum. This way all of my recipes are in one handy place, on my Kindle, and I can easily take that to the shop as my shopping list. The recipes can be described as “Every Day Cooking For Every Day Lives”, there’s nothing too fancy in there, and they range from starters and soups, to main meals including lots of curries, and finally desserts and cakes. I find that television chefs use too many obscure ingredients, and they seem to have every utensil under the sun to aid preparation. These recipes are essentially very simple, and are presented in an easy step-by-step format. The book was originally designed for the Kindle, so even in the paperback version there are no pictures, but do you really need to know what Key Lime Pie or vegetable soup look like before cooking it? I am only an indie writer because I have not yet been “discovered” by a major publishing house! Seriously though, I do not choose mainstream formats, preferring instead to challenge the market. A cookbook on Kindle? On Amazon.co.uk there are less than 1,000 available compared to 90,000 paper cookbooks. No market or a gap in the market; I’ll let the market decide. As I mentioned earlier, I do not write in mainstream formats so am unlikely to appeal to a traditional publisher just yet; however, I have had plenty of praise for my writing. My adult humorous novel Stags! reached number 1 on Amazon’s Free Kindle Humour list, and is currently in 3 Amazon bestseller lists for paid books. Self-publishing is great for getting your work out there quickly and relatively easily, but it is also a great tool for learning. I knew nothing about fonts until I self-published Stags!, and I knew nothing about Kindles until I started to look at that medium too. You quickly realize that marketing is the hardest thing in the world, and the realization that no one will buy your book just because you believe in it is a harsh lesson, but one that all indie authors must learn quickly. I have tried book signings; for instance, my children’s picture book Ole And Zac And The Port Of Tumbattle has a pirate theme, so I sat outside a couple of local Tesco supermarkets dressed as a pirate and signed copies. A book signing for Stags! was featured at the Levenshulme festival, as a result of which I got coverage in The Irish Post. These are fine for small coverage, and I realized how much fun it can be to dress up as a pirate, but by far the most successful marketing technique has been via KDP Select. This allows you to offer your book free for up to 5 days every 90 days, but during this time you must push it. Twitter, Facebook, blogs, Goodreads, anything you can think of. But it can’t just be a one way thing. Follow blogs and they will follow back, but you must participate. Download other free books and engage with other authors. Contact Pixel Of Ink, Kindle Nation Daily, Digital Book Today, and others, and consider a paid promotion which can be done for as little as $29.99. If you are successful you will get thousands of downloads. Stags! got around 5,000 in 5 days, and then the fun really starts. If you have done it right you should continue to push, push, push when it is a paid download again. Stags! hit around 200 paid downloads in the first week and then sales started to taper. Bear in mind that the more sales you get, the more Amazon will “recommend” your book. If you can get it into the top 20 in any category this will generate more sales. When a potential customer looks at a bestseller category the first page has 20 entries. A few will go to the next page of 20 entries, but after that visitors dwindle. It’s a bit like getting on the first page for a Google search. The next phase is to drop the price to less than $1. This hits the bargain promotions and sales will get an uplift. Continue to expand your network, and make use of your free KDP Select days every quarter. There is no such thing as overnight success. You have to work at it. I disregarded local newspapers and trying to get book reviews. There is just simply not enough coverage. If you have enough friends they will cover the local area for you, and even in your own area, if someone does not know you personally they will not be inclined to buy your book. Business cards and flyers are invaluable, but cheap and cheerful will do fine. Make sure they have your email address on, mobile number if you really must, book details including website and blog details, and Amazon, Amazon, Amazon. Amazon is king and is a very trusted site. If your book is on Amazon people trust it. In terms of internet marketing there are tons of free sites that will push your free days, including Pixel Of Ink, Digital Book Today, etc. 8. What’s the most important thing you’ve learned about self-publishing that you didn’t know when you started out? It’s all about the marketing. Apart from your family and friends no one will buy your book – you have to sell it to them. Or get Amazon to sell it for you by exploiting the free KDP Select feature as described. For paperbacks I now exclusively use Createspace. I have used Fast-Print, but only because Createspace did not support UK distribution. Now they do. Createspace is quicker and easier to use, produces a better quality product, and the finished book gives more profit to the author. The only caveat to this is that the Createspace cover designs are limited, but I would not be surprised to see them expand these in the near future. Start slowly and dedicate at least an hour per day to it. Don’t expect it all to happen overnight, and do not disregard any channel. It is a learning exercise as much as a marketing exercise, and by the time you get to book number 10 you will be well on your way to becoming an expert! I am currently working on a sequel to Stags!, the working title of which is Infidelity. I got some really nice fan mail after my latest marketing exercises, and that prompted me to finally put pen to paper, metaphorically speaking. I am also looking to produce a book of dark poetry in collaboration with a friend who does some terrific illustrations. In the pipeline there is the biography of an English rock and roll singer, but he is based in Madrid so there are a few logistical issues with that one! Having launched three books in three very different genres, each one challenging the market in a different way, it would have to be “Laughing in the Face of Tradition”. You can visit my website at michael-madden.co.uk and my blog at mmm-number-1.blogspot.com.